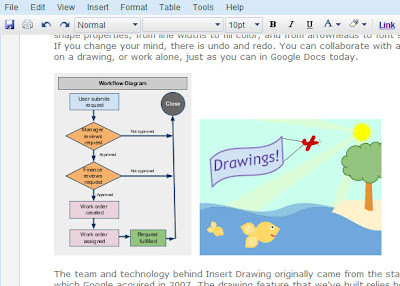 I'm excited to tell you about Insert Drawing, a new feature we've added to Google Docs. Now you can create and insert rich, colorful drawings into documents, presentations and spreadsheets, to illustrate your ideas or just for fun. It's easy to create drawings using lines, free hand scribbles, text labels and a large choice of shapes that you can move, resize, rotate and adjust. Group, order, align and distribute and other features are available when you select objects you've drawn. You can also customize a range of shape properties, from line widths to fill color, and from arrowheads to font size, and much more. If you change your mind, there is undo and redo. You can collaborate with a friend or colleague on a drawing, or work alone, just as you can in Google Docs today. The team and technology behind Insert Drawing originally came from the startup Tonic Systems, which Google acquired in 2007. The drawing feature that we've built relies heavily on a relatively new capability in browsers: the ability to render vector graphics. We use the SVG (scalable vector graphics) standard to accomplish this in most browsers and VML (vector markup language) where SVG is not available. Only recently has the performance and ubiquity of such technology enabled us to deliver what we hope is a delightful feature. As browsers continue to improve, we can deliver more and more useful cloud-based functionality. As with any new feature, we'll be adding new capabilities over time. But even though we have our own to-do list, we'd love to hear about how you think we could improve drawings. You'll find Drawing within the Insert menu, so try it out and tell us what you think in our Help Forum.